Nowadays, data is one of the most important assets for computer users. This high quality hard drive protection box is dust resistant and Anti-static. The external & internal reinforcing rib Providing Extra Layer of Protection. SISUN HDD storage box is meticulously designed with first class workmanship, using high quality material, providing high performance to customers who request the best. This new anti-vibration shock-proof 3.5" HDD protector has built-in anti-static cushioning mat, making your HDD storage more secure for storage and transport. 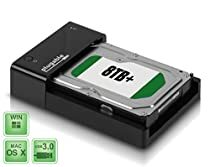 The easy labelling design makes user to label their drives clearer and easier.Comparing to other HDD Protectors, this box will be your best choice. Just a super storage case. 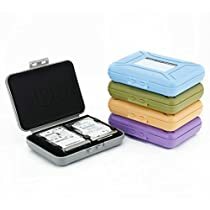 [[VIDEOID:9bd9eafce6287bd23e0ff02b66ce4cf5]] These are really great HDD storage cases. They fit the HDD very snugly and come with plenty of cushion pads to ensure the drive does not slide or rattle inside the case. The cases are easy to open and easy to close. When open the drive is easy to load and unload. The cases come in several colors are are interlocking for easy stacking with not sliding. Included is an extra label and plenty of pads. Purchased this to store a bunch of old hard drives I had lying around in anti-static bags. From that standpoint, it works well. The drives slide into the storage bays easily and the doors latch securely. The labels on each door are a nice touch. One odd design feature is the "hump" in the top of the case. It serves no useful purpose except to make it difficult to stack one of these boxes on top of the other. With five hard drives inside this case is fairly heavy - it would have been better to build in a carrying handle instead. 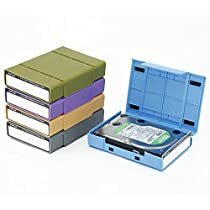 I ran out of WiebeTech anti-static hard drive cases and regret going cheap on these. Actually, they are not that much cheaper considering the different drives I store in the WiebeTech cases fit perfectly and the Sisun brand has an issue. I just tried three 3.5" drives from different manufacturers and they all wiggle inside the SISUN even with the added sticky padding. Awful. The WiebeTech at $1.30 more per case is a much better deal for storing precious data. I often take drives to an offsite backup site and do not want any unnecessary vibration during transportation. I also label my drive cases along the spine. Whose bright idea at Sisun was it to put a groove along the center of the spine to prevent the user from attaching a label? I hope these are truly anti-static at the very least. Despite the crappy design it would be worse if they created enough static to zap your drive. Fingers crossed.